Struggles by Auburn, Tennessee, Missouri and more have left the SEC pretty wide open, and the winner of this classic midday brawl will put themselves in prime conference championship position. Alabama enters the game in a weird position for the program: as the underdog, following a loss two weeks ago to Ole Miss. Meanwhile, Georgia enters the game on fire, but without any very impressive victories to their name. The Bulldogs have been all about running the ball this season, led by sophomore Nick Chubb. Chubb has been absolutely dominant so far in 2015, with 599 yards and six scores through four games, making him one of the Heisman frontrunners as we kick into October. Though, Alabama's strength this year has been their rush defense, which shut down Corey Clement and Wisconsin in Week One and has a number of future NFL contributors. It includes massive linemen A'Shawn Robinson, a 300-pound athlete who is a proven run stuffer. Another plus for the Tide's defense is that they won't have to deal with the tall and lengthy receivers that Ole Miss threw at them, because Georgia doesn't have that type of size on the perimeter. The Tide will be eager to prove themselves against Greyson Lambert, the Bulldogs' quarterback. A Virginia transfer, Lambert has been on fire as of late, giving Georgia's offense plenty of versatility. Though, he hasn't played a defense with the talent of Alabama's defense, and Tide DC Kirby Smart will switch things up with a number of different blitzes against the young quarterback. The question for Alabama is their quarterback play. Jacob Coker has struggled mightily and Cooper Bateman was not overly better in his short play against Ole Miss. 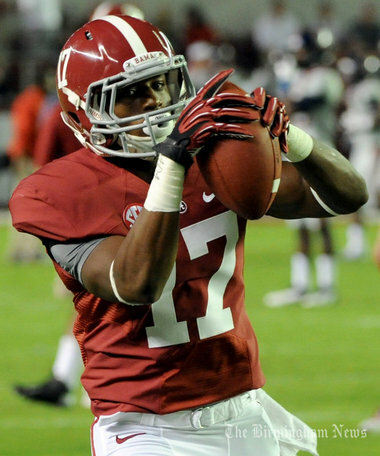 Add in the loss of Robert Foster at receiver, and Alabama's passing attack is pretty limited. Though, the combination of Derrick Henry and Kenyan Drake is scary and Georgia's rush defense isn't completely dominant. If they aren't disciplined and don't make key tackles in open space, the Bulldogs are going to have a tough time stopping the Tide's backs. Even so, Georgia has to have the upper hand in this matchup. Their offense looks terrific and their defense will work hard to force Alabama to move the ball through the air. Plus, they get Alabama on their home turf, "Between the Hedges". But, it isn't any secret that Mark Richt has had a rough time against top teams. It seems no program has been unable to get big wins when they need it most more than Georgia, in some of the most unlikely ways. While Alabama hasn't been playing great lately and my pick of them to beat Ole Miss looked foolish I still believe they can play off the "upset", particularly if Henry and Drake can find some holes. I just don't know if I believe in the Bulldogs enough, with Richt on the sideline and a still inexperienced quarterback leading the way. Notre Dame has not had the luck of the Irish so far this season. They have already lost quarterback Malik Zaire, running back Tarean Folston and a number of defensive contributors to serious injury. Though, even with that adversity, ND is 4-0 with a couple of very impressive wins. New QB DeShone Kizer has been playing terrific, joined in the backfield by another player who is playing wonderful, C.J. Prosise. The explosive Prosise has proven that he can run the ball or catch the ball extremely effectively. The Irish have also gotten a huge year from receiver Will Fuller, who has made a number of huge catches already for the Irish. Though, the Irish will get all they can handle from Clemson, who enters this game undefeated and trying to prove they are the best and most complete team in the ACC. Their own quarterback, Deshaun Watson, has played well enough to get some Heisman consideration. Although still extremely young, the true sophomore has proven that he can change games with the blink of an eye, and seems to play his best in the biggest moments. He will be joined by powerful Wayne Gallman in the backfield and a number of big play threats on the perimeter, including Mike Williams and Artavis Scott. The Irish defense is headed by a number of impact linebackers, Jaylon Smith and Joe Schmidt to name a few, but the defense as a whole has had their ups-and-downs. They have had success for the most part but haven't faced a defense with the versatility and speed throughout like Clemson's offense. That will certainly give the team a challenge but even so, the Irish do have the talent to respond with their own offense. Either way, this is sure to be a huge one. Notre Dame has had some big wins to open the year but their victories over Texas and Georgia Tech look a lot less impressive now that both teams have lost elsewhere. Meanwhile, Clemson hasn't beat much of note and they are desperately trying to add to their resume. This one is sure to be an extremely exciting and close matchup. Although I think Kizer and Prosise can still get the job done, I think Clemson is the safer bet. Picking a team with a backup QB is risky no matter how good they are playing, and it remains to be seen if Kizer could handle a place like Death Valley, South Carolina. Two undefeated Big 12 schools square off in an early morning duel. The explosive Oklahoma Sooners have been on fire to begin this year. New offensive coordinator Lincoln Riley and his first-year offensive scheme has worked to perfection for the Sooners. Texas Tech transfer Baker Mayfield has been on absolute fire this season and running back Samaje Perine has proven he can have monster games, including a four-touchdown effort in this game a year ago. Though, the Mountaineers may just have the defense that can counteract Oklahoma. The West Virginia has been absolutely dominant so far this season, but that is against inferior competition. The Mountaineers are stacked in the defensive backfield with studs like Kaleb Joseph and K.J. Dillon making plays. With those two ball hawking safeties in the back, Oklahoma may have a tough job throwing the ball, even with explosive senior Sterling Shepard. On the offensive side of the ball, WVU QB Skyler Howard has been playing extremely well so far this season. He has 916 yards and nine touchdowns and has proven to be a gunslinger in the pocket. Dangerous Wendell Smallwood and more give the Mountaineers plenty to work with on the offensive side of the ball as well. Meanwhile, the Oklahoma defense should be pretty well prepared with aggressive outside linebacker Eric Striker, and a capable secondary. An explosive pass rusher, Striker can take over games and West Virginia will need to contain him. Overall though, Oklahoma's defense has been much improved this season, proven by their effort against Tennessee. That defense should be good enough to at least contain Dana Holgorsen's air raid attack. If the Sooners do't turn the ball over and find other ways to get the ball downfield than simple deep passes, they should have success. West Virginia's defense is good but it may struggle against the versatility and explosiveness of Oklahoma's offense. Particularly with it being at home, Oklahoma is the safer pick.